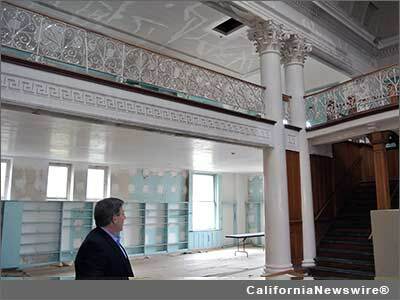 ALAMEDA, Calif. /California Newswire/ — After more than a decade of preserving and promoting the game of pinball, the Pacific Pinball Museum (PPM) is excited to announce it has signed a Letter of Intent with the City of Alameda to restore the vacant Carnegie Library as their new home. This magnificent 1902 building has sat vacant since 1998. This location will more than triple the museum's display capacity. The facility will also provide space for community events, classrooms, exhibits and many other expansions to PPM's already exciting programs. Since 2001, the museum has collected nearly a thousand pinball games but has only been able to display about 100 at their Webster Street location. A major portion of PPM's collection dates from the 1930s to '50s — an era that has a certain accord with the library. "It is extremely important to our mission that we occupy a building of historical significance," said PPM Board Chairman Larry Zartarian. "The 1902 Carnegie Library is a testament to American education and an ideal location for the PPM to educate visitors about art, science and history as related to pinball and its uniquely American heritage." City Manager John Russo put forth an offer to lease the Carnegie Library and the attached property for 30 years. In return, PPM will be responsible for completing the restoration and bringing the Carnegie up to current day building code requirements. Projects will include re-doing the electrical, plumbing and sewer utilities as well as adding ADA accessibility a HVAC system and fire sprinklers will be incorporated into the building to help ensure its survival. After spending more than $4 million in retrofitting and plans for the library, the city began searching for a museum that could complete restoration of the building. "The PPM has been bringing people to Alameda for over 10 years and has established itself as a stable and imaginative non-profit," said Alameda City Manager John Russo. "The prospect of having a pinball museum at the Carnegie is exciting and the City of Alameda looks forward to taking the next steps with PPM to make our common vision a reality." PPM needs to raise some $3.5 million in the next two years in order to make "the Smithsonian of Pinball" in Alameda a reality. Dedicated to preserving pinball history, science and art, the PPM tells the incredible story of how American ingenuity combined with culture and our fun-loving nature to create the ultimate interactive kinetic art. PPM's collection spans an era of broad technological development that teaches about scientific advancement and pinball art's cultural reflection and impact on society. Andrew Carnegie's donation toward ongoing education of the public should not be forgotten. Much like the Carnegie Library's story, pinball's story stands at a crossroads where it could be forgotten. The art, the technology, the American history behind pinball, could be lost to future generations if not for this effort. If you are interested in helping, contact the PPM at info@pacificpinball.org or visit http://www.pacificpinball.org/ .